Lazio supporters boycotted Sunday's Serie A home match against Atalanta in protest at president Claudio Lotito's running of the club. Fan anger has grown amid poor league form, a lack of incoming transfer activity and the January sale of playmaker Hernanes to Inter Milan. Maximiliano Moralez's goal gave Atalanta a 1-0 win over Edoardo Reja's side at a near-empty Stadio Olimpico. 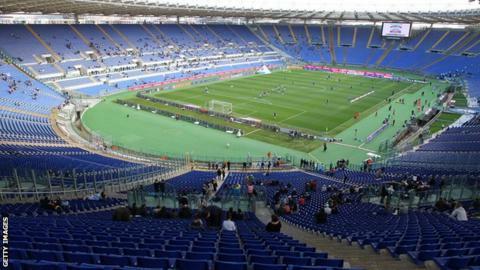 "It's a real shame to see the Olimpico deserted," Lazio boss Reja said. "We were in with a chance of achieving something significant but it's difficult to play in these conditions. "This situation can't go on. It's a disadvantage for us, as we've seen today." Those Lazio fans who did attend made clear their opposition to Lotito with banners draped over empty seats. One read, "it's him or us", while another displayed the message, "Lazio is ours and we will leave it to our children". Supporters have been demonstrating against Lotito since the start of the season, boycotting the opening 15 minutes of a match in September in protest at the club's perceived lack of activity in the close season transfer window. Lotito also sacked Vladimir Petkovic in controversial circumstances in January, shortly after the Bosnia-born coach signed a deal to take charge of Switzerland from next season. The dismissal was preceded by a week of chaos, during which Reja took charge of training sessions while Petkovic said he still considered himself to be coach. After the sale of Hernanes, around 40,000 fans took part in a protest march ahead of last month's 3-2 win against Sassuolo and displayed more banners during the game. Lazio, who have won five of 10 matches in which Reja has been in charge, stayed eighth after Sunday's defeat with 38 points but have dropped six behind Inter Milan, who are fifth and in the lowest Europa League qualifying place.